I haven't tried eating any Korean food before because my first impression is that, everything is spicy. I wasn't into spicy food at the time. I don't even eat California Maki with wasabi. Or sisig with lots of chili. It all changed when I was introduced to Mr. Kimbob. A friend of mine ordered a Bulgogi Bibimbap when we were at SM Megamall after lurking around Toy Con Day 2 earlier this year. She told us to try it after mixing all that there is in her plate. I took a bite and I was surprised that I can handle the spiciness of the Kimchi. 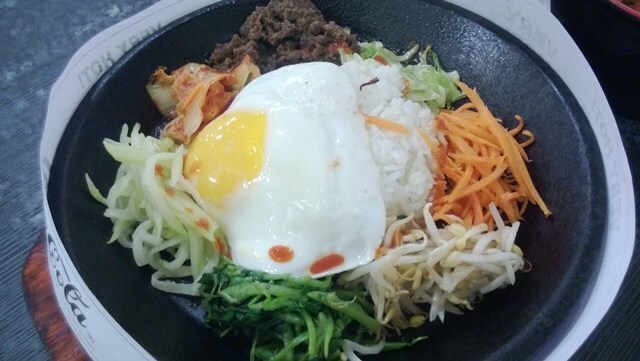 Bulgogi Bibimbap is served on a hot plate and is made of rice, bulgogi beef, bean sprouts, carrots, cabbage, spinach, kimchi and a sunny-side egg. The right way in eating this, which is also written on the paper, is to mix everything. Your preference if you want to mix in the kimchi or not, because that's the only side dish in this meal. I usually eat mine with the kimchi mixed in. Spicy sauce adds a kick to the flavors. The rice is kinda dry. Not enough kimchi for me! Will I eat here again? Yes! Will I recommend this to friends? Definitely!